I rang in the new year last night on the Millennium Bridge with a couple of hundred strangers and good friends. Danced on the tube, popped bubbly on the street, I kissed a stranger on the lips at midnight and ate soup with the most beautiful Swedish man in my favourite bar. We laughed, we sorta watched the fireworks and we toasted to a great, new year. For some of us, we wanted to leave behind not-so-good things that chased us in 2011 and look forward to a bright beginning. 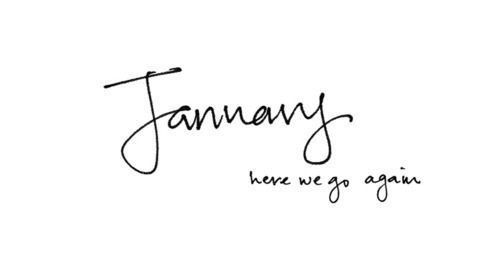 But the most important thing I learned in the last year is that life is what you make of it and what you want from it. The more you put in, the more you get back out. I’m a Yes person at heart and being open to things can sometimes be risky but the rewards are so worth it. Saying yes to things has connected me to more amazing people and adventures in the last year that I could ever have hoped for. So… to saying yes more in 2012. I love this guy, no idea what he is singing about. I’ve talked before about how much I love singer songwriters, I’m not sure why… maybe because their performances are so raw. No hiding behind bass or drums but laid bare with lyrics. Songs like these are either beautifully written or instantly forgotten. A good singer songwriter will capture your attention and catch your breath in a few bars. Talented lyricists like Keaton Henson take everyday, any day occurrences and make them magical, urging you to hit repeat and imprint every verse in your mind. I may never get to see this guy perform as he suffers from terrible stage fright, but it’s perfect to know he is out there making songs like this. Yeah you know it, it’s Michael Jackson Monday. You got your power song, I got mine. Let’s own this week. No one wants to be defeated, Showin’ How Funky Strong Is Your Fight. This is a beautiful track. These are slow tracks, if you hate that kind of thing, how about some beats? This is a really young English band from 2002, but they kinda rock. A new discovery for me; a little indie, a little pop, an upbeat voice with touching lyrics, introducing Mississippi native, Maggie Eckford. I think her voice is a little young for me to enjoy all the time, but I can see her being a big thing in the younger indie set. Life can be serendipitous sometimes or Vancouver can just be small, I can’t decide. On my way home from downtown tonight, I had plans to sit in front of my laptop and apartment hunt, but I bumped into Rick C. This has happened before and he always looks surprised, he forgets we live in a village. He was off to a dinner tweet up with a bunch of people, including one of my favourite ladies Colene. And so I went too and happily got to bump into other people I know and meet some new faces – some I was already following but had never met. The restaurant confused us at first, a lot of African stuff on the walls but Asian food on the plates? 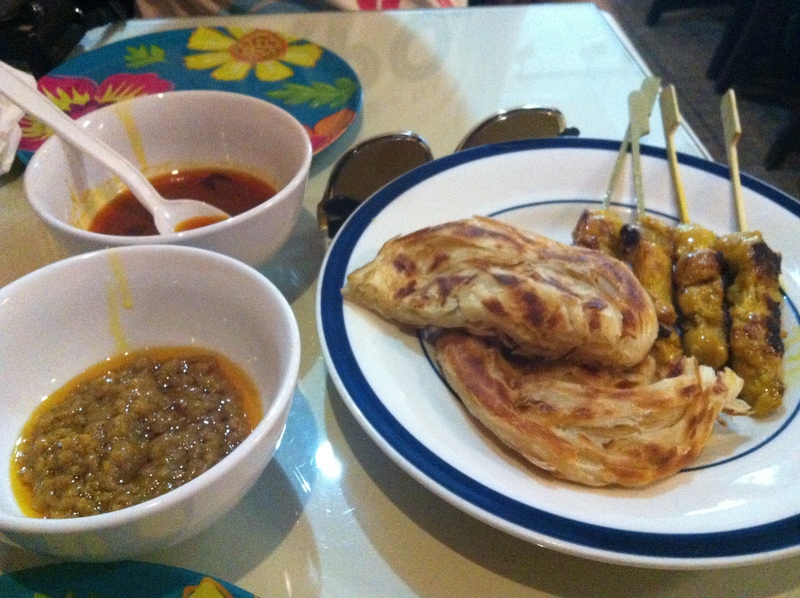 It was a restaurant serving two ethnicities that shares space, Malaysian and Ethiopian, Malayopian. 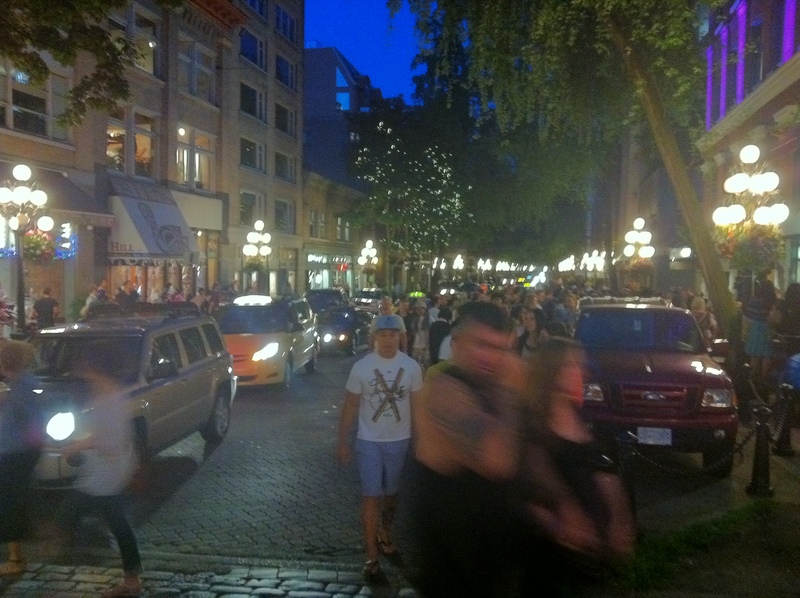 Tonight was also the night of the Gastown Music Festival. I cannot believe I was planning on going home. 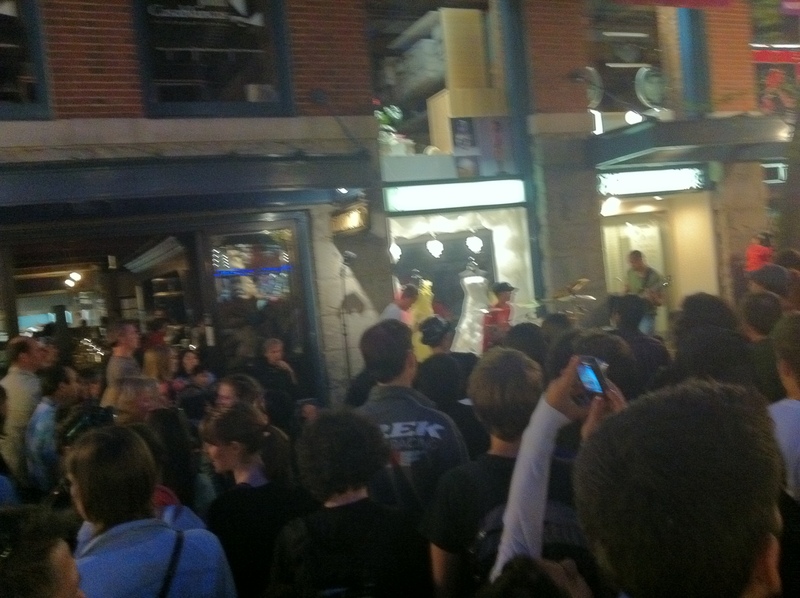 The streets were full of musicians and bands, some bluesy and awesome, and some 1990s thrash rock. 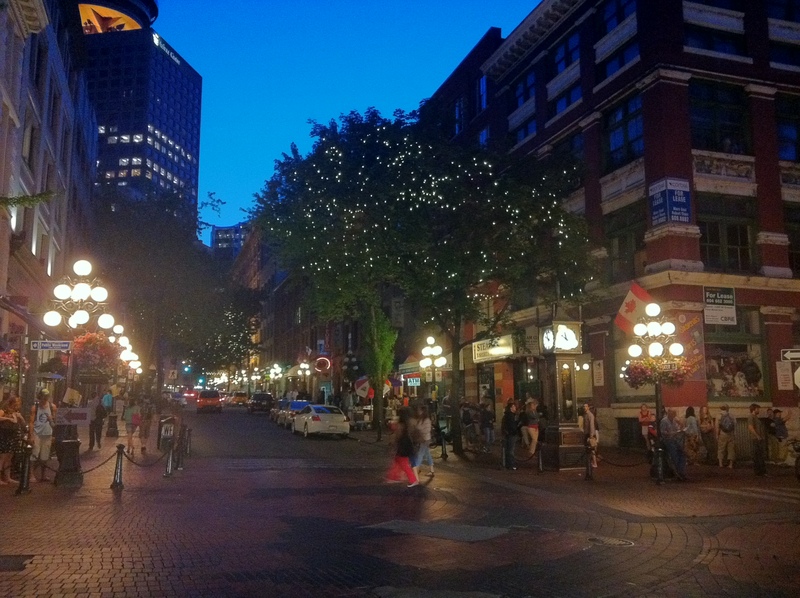 I always love to see Gastown sparkle. Look at all these people, where are these folks usually? They must have bussed them in from other cities. I know, the writing and photography I’m posting is worse than ever. Can you believe people pay me to write words? Hopefully I will be able to get some clarity to write something good soon. Actual thoughts, instead of I went here and then I went there. Ann and Barry had an ice cream and then Barry went home. Ann was sad because Barry is such a cheat date… Honestly, I don’t even know.